It's official: the Pentax K-01 is to be released in March, complete with the world's thinnest interchangeable camera lens. The K-01 is a new compact system camera (CSC) that features a 16-megapixel APS-C sized CMOS sensor housed in an aluminium body. It's the second mirrorless camera from Pentax, but differs from the tiny Pentax Q in both size and lens support. 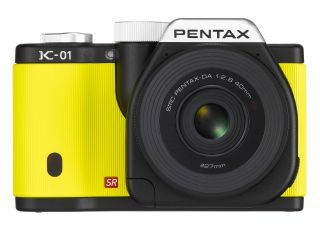 Pentax called on celebrated Australian industrial designer Marc Newson to assist with the styling of the K01, which is being made available in a selection of colours (of course). Rumours of the Pentax K-01's specs and release date started intensifying last month, and these have proved pretty accurate. The big news is that the camera is compatible with all Pentax K-mount lenses. As the K-mount was created in 1975, this gives K-01 users access to a vast range of lenses without the need for expensive adaptors. Having the K-01 integrate easily into an existing Pentax SLR system makes sound commercial sense for Pentax, too. Additionally, the camera carries Pentax's 'SR' sensor-shift image stabilisation system which is compatible with all legacy lenses. The K-01 is launching with a new 40mm lens. Pitched as 'the world's thinnest interchangeable lens' at the time of its production, this Marc Newson-styled prime lens is just 0.36 inches thick and weights 1.8 ounces. The K-01 offers a normal ISO range of 100-12,800, which can be expanded to ISO 25,600 via a custom function. Continuous burst shooting is set at five frames per second. In-line with Pentax DSLRs and the Pentax Q, the K-01 can record images in both JPEG and DNG raw format. Shooting modes include Program, Aperture Priorty, Shutter Priority and full Manual. There's also a range of scene modes and 19 digital filters that can be combined and applied to a single image. An upgraded HDR mode offers extended dynamic range by blending three images taken at different exposure levels. Users can manually select the level of exposure increments and the strength of the effect, while the camera automatically aligns the images (so there's no need to lock the camera on tripod to take the individual frames). Full HD 1080p movies can be recorded at 30, 25 or 24 frames per second in H.264 format. The K-01 features a direct video recording button and a built-in stereo microphone, plus an external microphone port. An HDMI terminal enables both video and sound to be output to a compatible TV. Other highlights of the K-01 include a multi-exposure mode (up to nine exposures on a single image), interval shooting for time-lapse photography and a contrast-detection autofocus system with 81 selectable AF points. The Pentax K-01 UK price is £629.99, body only. It will be available from the end of March 2012 in three colour combinations: black with black grip, black with yellow grip and silver with black grip. Three Pentax K-01 kits will also be released at the same time, including a K-01 with the new 40mm lens for £679.99.